The debate. Part II | Climate Etc. Countdown to the ‘conversation’ between Mann, Titley, Moore, Curry. Looks like you can now register for the live broadcast, for a fee of $10 [link]. I will post my talk about 15 minutes before the start of the event. If anyone knows how to make a transcript of this, it would be greatly appreciated. Hope you are getting a ‘cut of the action’. They are of course benefiting from your intelligence, research, position in the community, etc. No one would pay $5 to listen to Mann alone,,,. so the critical thinkers are what’s of value. I am getting no honorarium, no cut. A learning experience . . . I would back out of this event if the fee wasn’t disclosed in the planning stage before the talent was lined up. While I’m a capitalist, an important academic discussion deserves a wide audience. I believe there’s intention behind building a wall around this, the law firm is probably filtering expert testimony solely for strategic reasons. There’s not much financial incentive behind the need for a fee, and every incentive to minimize the audience if the purpose structurally is for developing litigation argument, they know it will minimize the audience, an open forum will bring many more eyes and have the potential of backfiring (on the cause the needed information). I still believe the debate is the basis for legal due diligence. I don’t think the ‘fee’ is because of the organizers. I suspect it resulted from negotiations with one of the participants. I hope someone makes a transcript of this or a podcast. Good luck, Dr. Curry. I expect it to be an engaging debate and know you’ll do a great job. A transcript or video would be nice. Dr. Curry – I believe you are likely correct … when they initially responded to me with the live stream info their intent was it would be free … sponsored by the law firm. Scott, she would appear foolish if she asked that because this paper doesn’t say that at all. Perhaps you linked wrong? Good point. They’re probably organizing, promoting, and putting on this debate because they don’t want anyone to be aware of it. Joshua, I expect coy condescension from an ankle biter, no matter. Open and challenging dialogue is generally always a good thing. I’m simply cautioning that there are “potential” motivations for a law firm sponsorship for the debate that may have little to do with caring how large of an audience participates. Healthy cynicism should at least be considered whenever dealing with lawyers, informal setting or otherwise. At any rate, between the two of us, I’m the one who doesn’t trust lawyers, and who believes the media are not doing their dutiful job portraying the issues properly. Unjustified cynicism? Cheers. Well, one of the participants asks 20 grands for each seminar he gives, plus air ticket in business class and a hotel of his choice. Maybe the 10 bucks are needed in order to cover this expense, to the organizers? 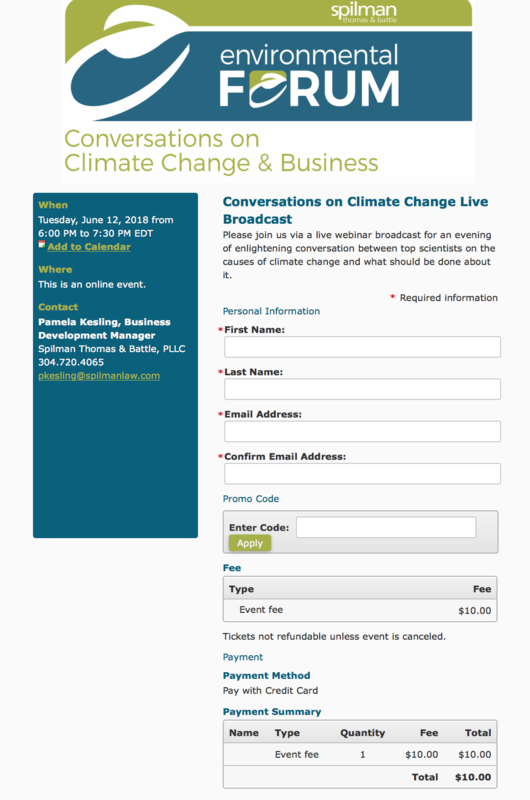 Mop-up … this event originally did not include any option other than in-person attendance … I reached out to them (as did some in a thread at WUWT) and suggested the profile of this event merited a live stream. They initially responded they could not do a livestream, or post a video later … however, to the organizers credit, they apparently went back and worked out the details to be able to offer the live stream. There is a considerable cost for a professional live stream and I have no problem with them charging a reasonable fee. I think their efforts, both in managing to get certain players to the table, for a public discussion, are worth commending. Scott, Although I’ve expressed extreme suspicion to the motivation of a law firm running an important academic discussion, I’m hedging those thoughts. More discussion is a good thing ultimately, but only if there’s an audience to hear it. Since cost is presented as being a possible issue for them, it would be interesting to see what they would have to say when asked to provide a video and also permission to distribute it freely after the event. If they balk at it then something’s fishy. I don’t see much benefit in a thin audience, probably including media participants who then can parse the debate into only the parts they want to report. We all know how that would skew. I’ll commend it with the allowance of a total distribution of the event, YouTube or whatever. And I could have pulled it off with 3 cameras and live feed to YouTube for next to nothing…and done professionally. The live feed they setup was an absolute disaster. Sorry I paid $10, because after about 10 minutes, I gave up. Still trying to understand why it’s okay with the petroleum-hating Left that France and Iran have nuclear power but the US can’t. Your graphic from “Fundamental disagreement about climate change” is missing a third, fast-growing section, scientists and engineers for external forcing by the sun. This period coincides with Fig 10 from my Solar Cycle Influence poster, depicting solar activity since 2003. Fig 10 shows a decadal scale warming-cooling threshold line in TSI, SSN, and F10.7cm flux I determined in my work that matches the 2003-2011 period discussed in the aforementioned study. Others have finally caught on. The very best way to convey to a businessperson how TSI drives ocean heat accumulation and thus the climate is by using an analogy to a financial model breakeven analysis. My warming threshold is like a company’s operating breakeven line, and solar activity is like cash flow in. Business profit [temperature] depends on whether there is enough cash [solar energy] flowing in over time to reach or exceed breakeven. The climate business follows the solar cycle influence – imagine running a business on an 11 year cycle with long periods of low, below breakeven income, followed by extremes in the positive. This is what happened at the top of this waning solar cycle, producing the 2015/16 ENSO as described in my poster, and now temperatures have followed the cycle down, dropping into the solar minimum, the next cycle. I wish you all the best in your efforts tomorrow. Some people, your opponents, claim we can change the climate. I think we can’t change the climate much at all because of the solar influence, no matter what we do, so we continue to waste a lot of time, effort, and money on the wrong focus, like CO2 emissions. Agree about the sun thing. If it comes up, perhaps someone should mention that in addition to the ~.1C atmospheric solar cycle variation observed, tide gages suggest an additional heat flux into the oceans ~ two times the size (IIRC). And that flux would be filtered through the chaotic processes of the ocean cycles. The fee isn’t a big issue, but you can’t actually register for this without also opting in for marketing spam. Someplace no one can hear, I shall be singing for you. There are many software formats like Movavi screen recorder for capturing live streamed video. I have not used them myself so I won’t volunteer but someone must have some experience with such things. Don’t let them get you agitated. Women’s voices in particular become shrill when excited. If people do get excited, be the leading voice of reason by speaking low, slow, and loudly over cacophony. Expect to address the declining nutritional content of food as unexpected consequences. Informed consumers are primary remedy. Easily addressed by food choice and food processing. Fermentation a key process. No one wanted to invest in the region, despite their oil wealth, because of the threat it could be stolen or destroyed. maintain control by voice and by walking up to their desk if necessary. I would however suggest that she stay out of all personal skirmishes with Mann. Let him go personal, and when he does, calmly note that he is going personal, and steadfastly refuse to follow him into the gutter. Don’t claim to be a victim, but if he does try to personalize, merely demonstrate that you wont be a victim to his bullying, and return immediately to the science. If the two year old throws a tantrum, smile and return to the science. It is what people are paying to hear. Refer to him as Dr mann, or professor Mann. Outclass him, that’s a low hurdle. That’s how I became a skeptic. It wasn’t the science. I had no idea what the science said. All I knew was that all the prominent warmists took the low road. They still do today. Judith distinguished herself by always taking the high road and putting science first. She still does today. It doesn’t take a genius to understand who to follow and trust. I am aware of the difficulty of being considered of having something relevant to add in the present discussion on climate since there are many voices offering something to claim their rightfulness. 1- Models confuse the science in which those are applied. Factions opposed in views will not come together by using models. And even there is no need for it. Darwin did not need an algorithm and a model to identify genetic evolution. The observational evidence was so strong that unified the scientific community. And evolution is a process comparable with climate, reacts to pressures. Actually, sea ice acts as a barrier for the heat transport *from the atmosphere to the ocean. The line of research offered taking Arctic SST as responsible for warming processes is not considering the thermodynamics behind changes in phase (liquid/solid/gas) and the difference between condensible and not condensible GHGs. Heat moves between locations AND phases. SST warming the atmosphere would loose heat, thus forming ice. 3- Between global warming and global cooling there is global mixing. I have discussed the specific topic of Solar activity in singular publications looking at aspects considering that Solar activity can modify the behaviour of the atmosphere as well as modifying the composition of the atmosphere can modify the impact from the Sun. I hope that my comment is not found intrusive in the line of discussion offered by Judith. I just want to offer my point of view. Dr. Curry. Good luck. Secondly, I’d hope (I know it’s something you’ve discussed in the past) that there is a clear distinction between ‘climate change’ and/or ‘global warming,’ and ACC and/or AGW. Consensus is that some additional GW, AGW, will result in forms of CC different (they always imply worse – but why should that be) from the ever present and dramatic naturally occurring climate change, ACC (or CACC – yikes). This has degraded now to the point where the average person has started to believe that any and all climate change is entirely man-made. And yet – what climate scientist would actually hang their hat on that one? Sign up for Zoom. Default is to record. Select the online broadcast. Then “Show” that screen. Zoom will record what is shown. Judith you should INSIST on closed captioning for the broadcast. Otherwise those who are deaf cannot benefit. once you have CC stripping it out is a breeze. Great point. In today’s world, one would expect CC along with the SAP. Want my $10 back – can’t understand a single word of this garbled mess. Yeah it was a mess. Always helps to know that it’s not just my desktop. Thanks ! !